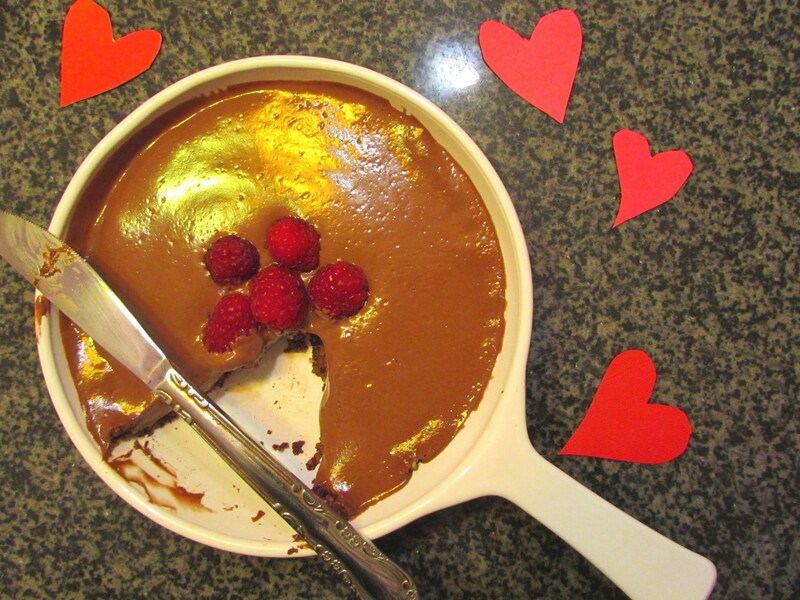 Another (rockin’) recipe in my 2015 Valentine’s Day recipe series. 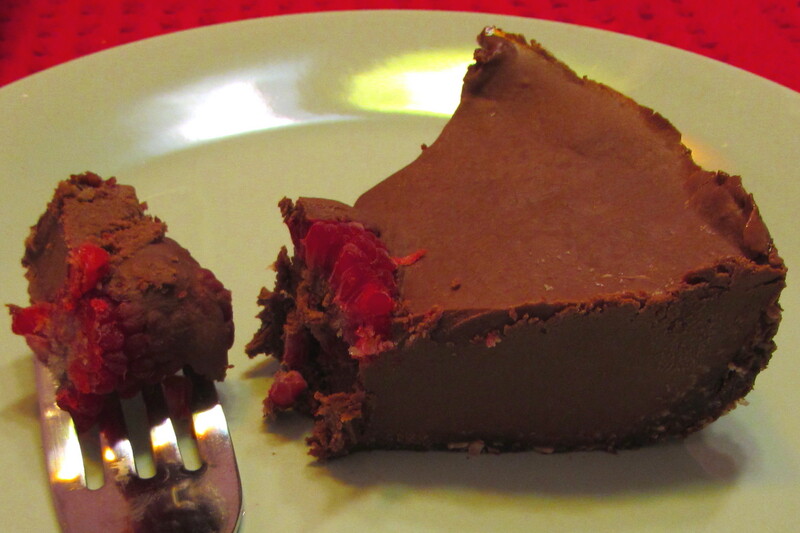 This Vegan, Dark, and Handsome Chocolate Mousse Pie is creamy and decadent, and completely dairy- and gluten-free. 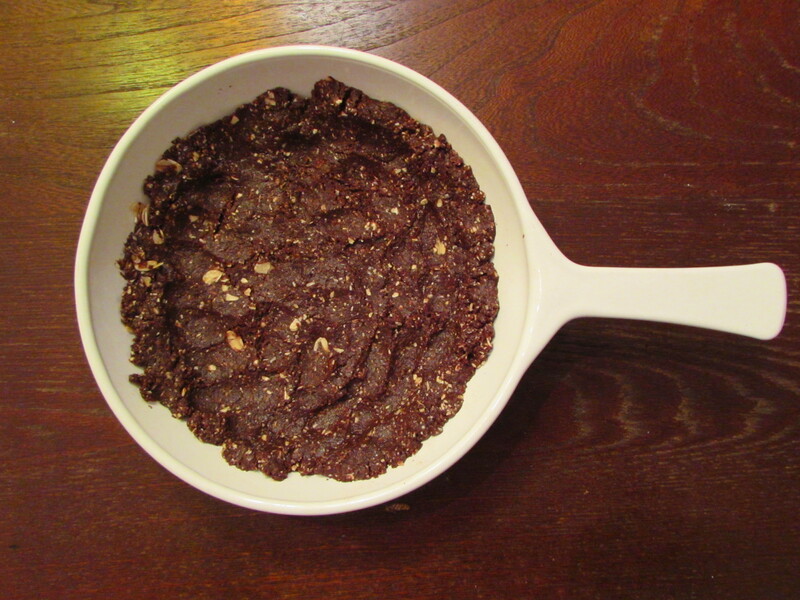 It is also no-bake, and comes together in a snap. I am a confessed choco-holic, while my beau is more of a fruit ‘fficianado. For holidays like this, I admittedly get a bit sad that we won’t be sharing any chocolate-packed desserts. But if I adapt a glass half full approach, I do get this entire little pie all to myself. *cackle, cackle, cackle* And, guys, it’s already gone from my freezer. I ate the entire thing. 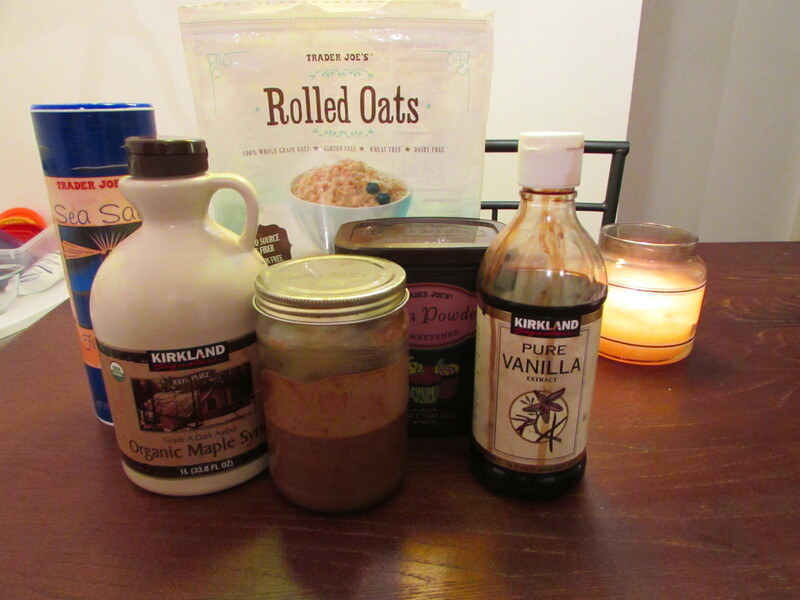 The ingredients are all things I have in my pantry: oats, cocoa powder, pecan butter (you can use almond / peanut butter as a sub), maple syrup, a touch of vanilla and sea salt, and some unpictured cashews and cornstarch. 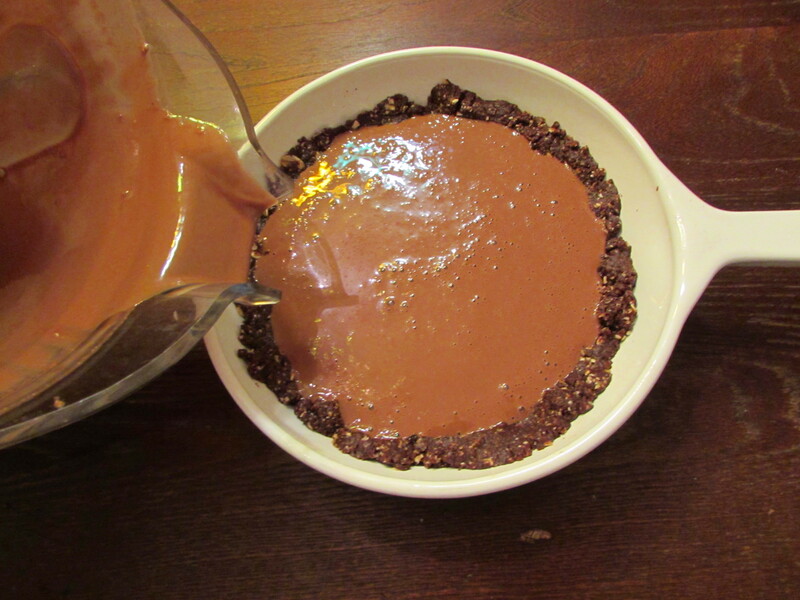 First, you make the crust, which is a mixture of pecan butter, oats, cocoa powder, and maple syrup and vanilla and press it into a small dish. My dish is approximately 6 inches in diameter. Then, you make the luscious cashew-chocolate filling by tossing the ingredients into your blender and taking it all for a whiz. 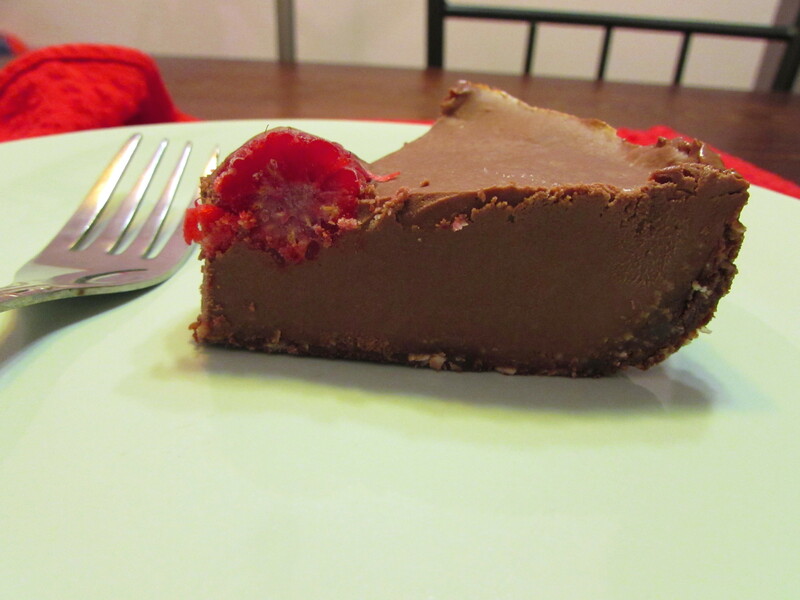 I added a few raspberries on top, because chocolate + raspberries is always a win in my book. Now, here’s where you get some options. If you’d prefer a solid pie, follow the directions as I just described, and then put the pie into the freezer overnight. However, this is equally delicious (perhaps more delicious?) if you press the crust into individual ramekins, pour some filling into each, and refrigerate for mini chocolate mousse tarts. I would advise against only refrigerating if you are using a multi-serving-size dish because when you cut pieces out, they will fall apart. 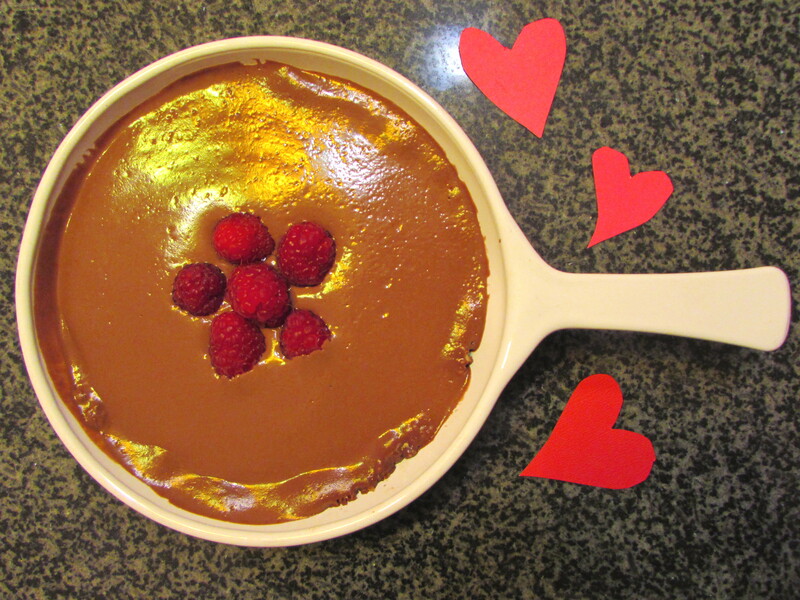 That’s why ramekins are the way to go for the mousse version. First make the crust: pulse the oats in a food processor until somewhat chopped, but not yet a flour. Add the remaining ingredients and pulse until combined. Press crust into a small rimmed dish (mine is ~6 inches in diameter), or divide up crust into 4-6 ramekins for individual servings. Drain the cashews from their soaking water. Add drained cashews and remaining ingredients to a blender. Blend on high speed until silky smooth. This took about 1 minute in my Vitamix. Pour filling into the crust. For a pie: put on a flat surface in your freezer and freeze overnight. For individual pudding portions (see note): refrigerate overnight. Chow down! Note: If you would like a softer, mousse-like consistency, pour the filling into individual ramekins and refrigerate overnight. You do not want to refrigerate an entire pie because then you will not be able to serve pieces very well- they will fall apart.